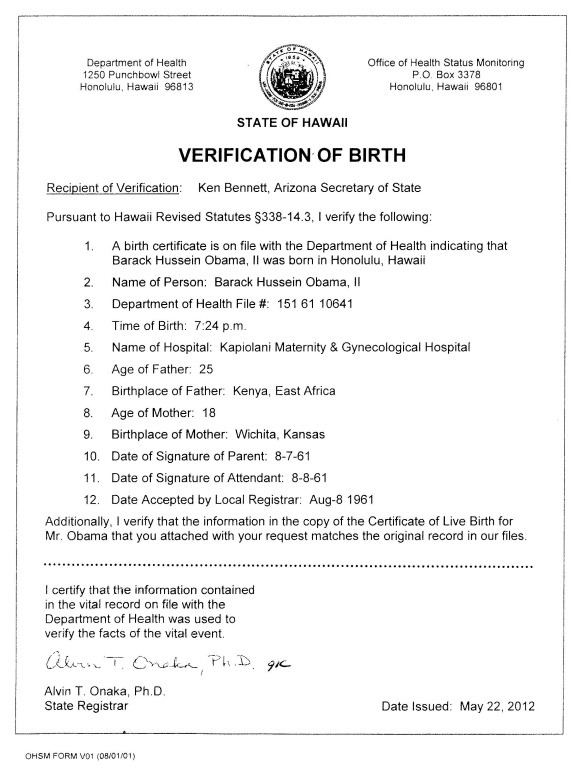 The Tucson Citizen reports the birther bill is back, introduced by Representative Carl Seel. His bill was passed last year, but vetoed by Republican governor Jan Brewer. Seel’s solution is to simplify the bill so that a candidate would only be required to sign, under penalty of perjury, an affidavit swearing that he or she meets the qualifications for the office, including their citizenship. If citizens were to question whether the candidate was qualified, Seel’s bill would state that the citizen would have standing to file suit against the candidate. 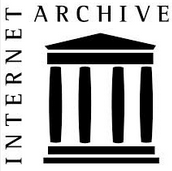 It should be interesting to see what if any effect the Georgia ballot challenge court proceeding will have on the bill. 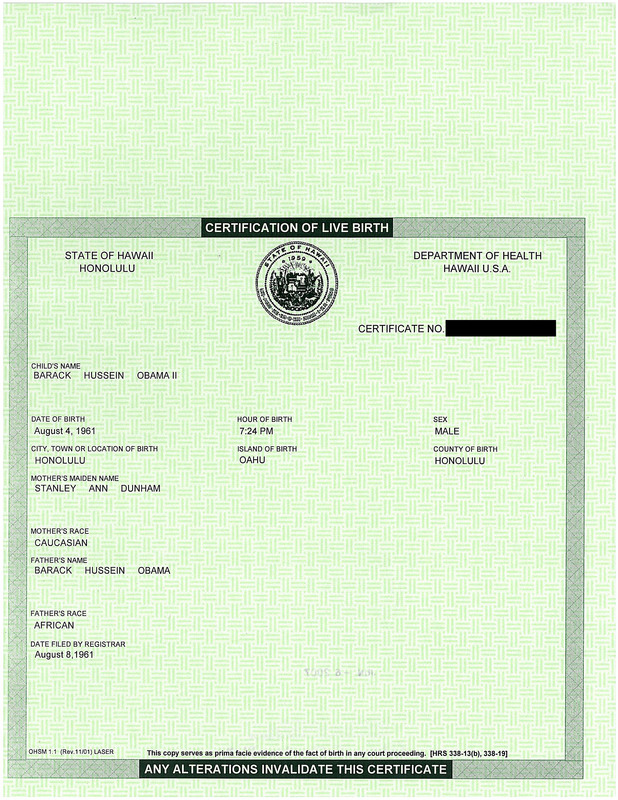 A birth certificate submitted to the court and positive determination of eligibility in Georgia would, in this writer’s opinion, take the wind out of the sails of a bill in Arizona. It is my understanding that the candidate is already required to do this in Arizona. It is my experience that Arizonans don’t suffer fools for long. But then again the State has been significantly Californicated in the years since I’ve been gone. Keith: Arizonans don’t suffer fools for long. They’ve suffered Arpaio’s circus for years. And passed some famously questionable legislature. AZ has been yanked to the deep right (influence of incoming population?). I haven’t looked into it, but suspect their budget problems were magnified by the influence of the same forces. 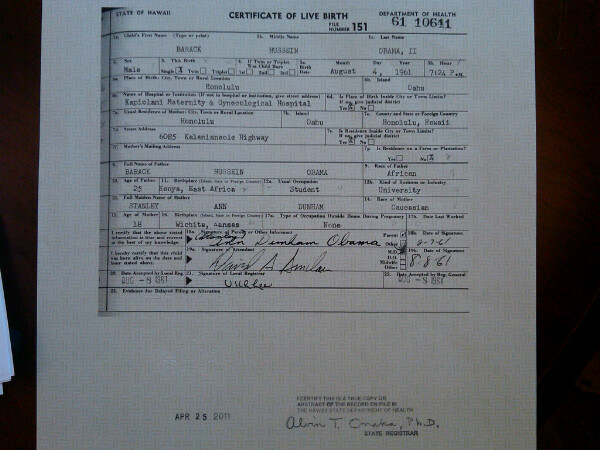 Speaking of which, I don’t recall ever having seen Mitt Romney’s birth certificate. If this law in Arizona passes, nothing would stop the filing of multiple lawsuits over Romney’s right to be on the ballot. Fair is fair. 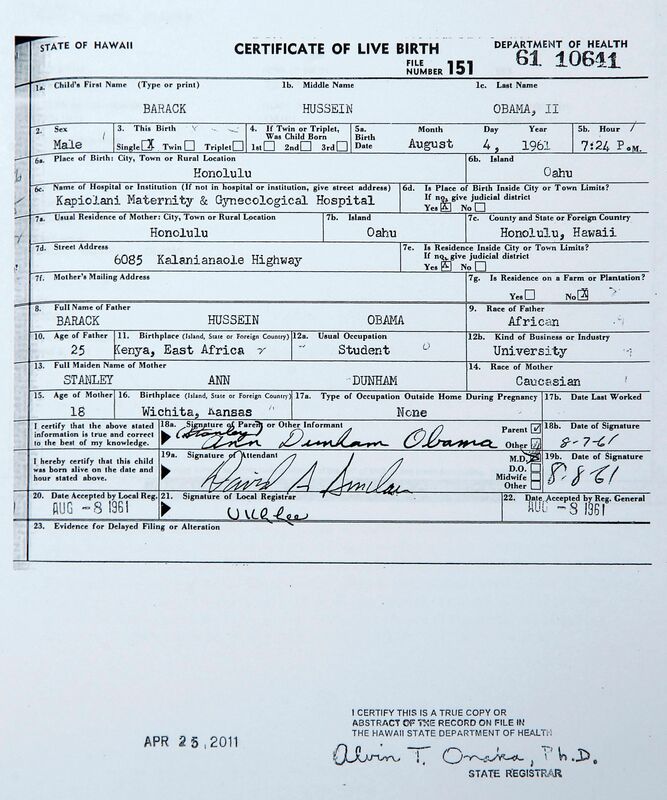 Here’s a link to a scan of the form that he signed. CAUTION, the pdf file probably has lots of layers! I guess what would be new in this bill is giving ordinary citizens the standing to challenge someone on the ballot. To me that makes no sense. If a voter believes someone is ineligible, they have a remedy-don’t vote for them. But only those who put themselves forward on the balott should have the right to a legal challenge. The NFL restrict challenges to referee’s decisions to coaches-if they let fans throw the flag, they would still be playing games from Week 7. By the way, now that the 2 Stalinists Drew and Commie Keviin have left, I have reverted to just plain Scientist. That form (or whatever the equivalent affadavit is for other offices) is discriminatory against people of Asian ancestry who use their surnames first and are well known that way, such as Yao Ming. If he were to be naturalized as a US citizen and wanted to run for office in Arizona, will they force his name to be placed on the ballot as “Ming Yao”? Just in case, I was only being sarcastic. I tried entering some fake code to display my sarcasm, but apparently the software filters anything out in left and right carrots. y_p_w: Just in case, I was only being sarcastic. I tried entering some fake code to display my sarcasm, but apparently the software filters anything out in left and right carrots. J. Potter: They’ve suffered Arpaio’s circus for years. And passed some famously questionable legislature. AZ has been yanked to the deep right (influence of incoming population?). I haven’t looked into it, but suspect their budget problems were magnified by the influence of the same forces. YeahBut… Maricopa County isn’t populated by Arizonans any more. It has been heavily Californicated. y_p_w: That form (or whatever the equivalent affadavit is for other offices) is discriminatory against people of Asian ancestry who use their surnames first and are well known that way, such as Yao Ming.If he were to be naturalized as a US citizen and wanted to run for office in Arizona, will they force his name to be placed on the ballot as “Ming Yao”? Yeah, that’s a minor irritation of mine as well. They could just as easily have said ‘family name’ or ‘surname’. But anyway, most Asians do switch their name around in western society. Often they even adopt an entirely western given name, just to make things easier for us. As I typed that last sentence, I had visions of someone’s school registration form that is of interest here every now and again. y_p_w: but apparently the software filters anything out in left and right carrots. Keith: YeahBut… Maricopa County isn’t populated by Arizonans any more. It has been heavily Californicated. That was my quickie answer on my way out the door. The more responsive answer is that Sheriff Joe is a lot of things, a fraud, ineffective, and bigoted; but he isn’t really a fool. And he has pretty much passed his use by date.